A dental implant is a replacement for your missing tooth’s root. The post is titanium, and it is surgically implanted beneath the gum line. 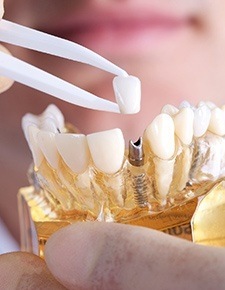 An effective option for replacing teeth located anywhere in the gum line, dental implants can stabilize a single crown, a bridge, or a full denture. 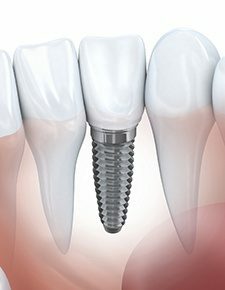 Dental implants are increasing in popularity as their numerous benefits for oral and overall health become widely known. No other option provides the stability and security of dental implants. Because the implants are made of titanium, they are able to actually fuse with your jawbone. This integration keeps the area stimulated, healthy, and whole. Without a prosthetic root, the jaw will gradually diminish over time. Dental implants are placed in oral surgery. We numb the jaw with local anesthesia and offer options in sedation dentistry as desired. Your implant dentist uses precise guides to ensure the dental implants are inserted right where they need to be. After placement, the gum is sewed together and healing begins. Dental implants are completed in two phases: the initial implantation and final restoration. A recovery period of four to six months occurs in between each phase. If you need a bone augmentation procedure before you get dental implants, that may add several months to the overall treatment time. 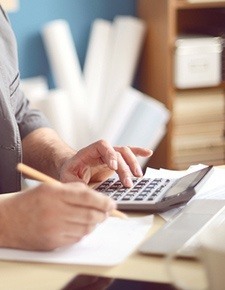 Most treatments range from six months to one year. Are There Any Disadvantages of Dental Implants? Some considerations with implant dentistry include the fact that dental implants do come at a higher initial cost than other options in tooth replacement. They also may take up to a year to complete, which means dental implants may not be the best option for older patients or for people who need their new teeth quickly. One big misconception about dental implants is that the procedure is painful -- but it’s really not. 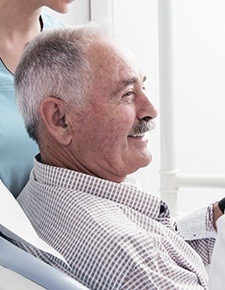 With modern anesthesia, sedation, and the latest techniques, we can assure that you won’t feel a thing throughout your dental implant procedures. What’s more, once you receive your prosthetic teeth, you won’t have to worry about dealing with painful oral sores due to a loose or ill-fitting replacement. Are There Any Restrictions With Dental Implants? No! Dental implants function just like your natural teeth, so you don’t have to worry about limiting your diet. After you have had your dental implants restored, you can eat what you like, when you like, where you like. Dental implants cost about $2,000 each on average, but the total cost of your procedure will depend on how many teeth you need replaced, where in the mouth they are located, and whether or not you require a preparatory procedure beforehand. If you are in good oral and overall health, you are likely a good candidate for dental implants. The only way to know for sure is to visit your implant dentist for a consultation. Request an appointment at Friendswood Dental today!